I just finished reading a book (Cooking for Mr. Latte) written by Amanda Hesser, a food writer for the New York Times. In one of her chapters she writes, "I have a few favorite dishes, I rarely make them." She goes on further to describe those old tried and true recipes, "You know, ones that I'll want to return to for years and years. You make it again and again, altering it to your liking, it becomes an expression of you aesthetic, of your palate, of who you are. And when you serve that dish to guests, they come to understand you a little better." Growing up I was a very picky eater. I can remember my Thanksgiving plate had Artichoke Dressing, Crescent Rolls and "The Dish". Baked Macaroni and Cheese. For years it was one of the only side items at gatherings that I truly enjoyed. And it reminds me of the holidays. Even though times have changed and these days my plate is running over with everything available, I still crave that classic dish. It wouldn't be Thanksgiving (or Christmas, or Easter, or - ok you get the point) without that side item. So if I were home this Thanksgiving, I would most assuredly bring my Golden Macaroni and Cheese to my mom's house and would like to suggest it to the members of my family who will be pitching in to help my mom this year with Thanksgiving dinner. The easy method for making the thickener for the cheese sauce is the key to this recipe. You simply shake the ingredients in a jar - it is fool proof and fun! I know that Baked Macaroni and Cheese may not be the most traditional Thanksgiving side item, but I promise you it will be a hit if you decide to include it on your menu. The children at your dinner will be ecstatic, because what child doesn't love Mac n' Cheese? And the adults will be thankful for this classically rich dish as well. more baked macaroni and cheese please! 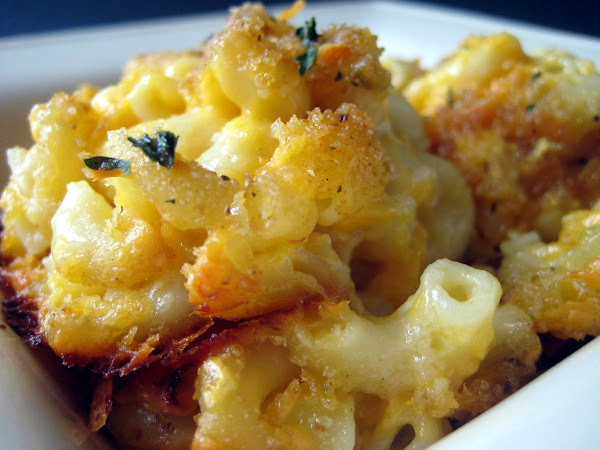 (I just added your baked mac and cheese to our Thanksgiving day menu). It looks ThAT good. This looks delicious! 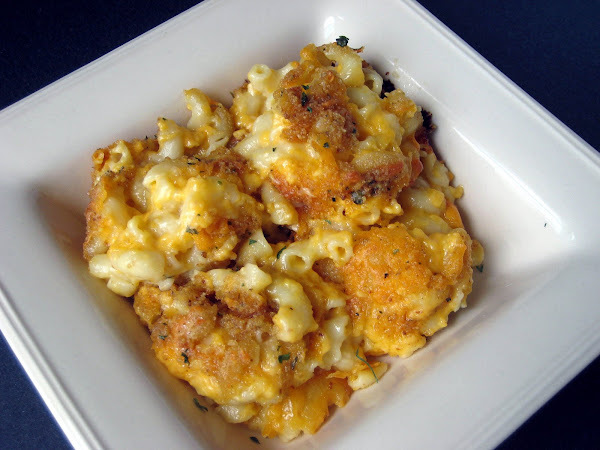 I am still looking for a "go-to" mac and cheese recipe and plan to try this one very soon. yum! yum! Gorgeous photos too! I will definitely be trying this one. I love that you use whole milk and butter; can't beat that. I am loving your blog. Mesmerizing! Macarroni dish is staple whenever wife is doing the cooking. your mac & cheese looks delish! and you are an absolutely GORGEOUS bride! I've had a serious mac and cheese craving lately and I am looking for some ideas. This looks like a delicious classic. Yum. Sometimes we all just need a little homemade mac and cheese. That looks fabulous! I've always wanted to make my own macaroni and cheese...I have to admit, I've been using a box all these years! Your blog is wonderful!! and makes me so hungry!! I'm going to try the mac n' cheese tonight!! I made this last night, and my husband and I loved it! I used Italian bread crumbs, since that's what I had on hand. It was delicious! Ok, Wish me luck, going to try this for the office T-day Lunch.. maybe ill do a dry run this weekend. That mac and cheese looks so good! Can I make this the day before and just put it in the fridge until I need to bake it? I'm new to your blog and absolutely love the recipes you put up! I make this exact same mac and cheese and it's my signature dish too. We also have the Andouille Cornbread Dressing every year at Thanksgiving! Just made this and it was a hit. You've inspired me to start cooking again! Do you have to boil the macaroni first? This is seriously good!! I tweaked it a little (cuz I love bread) and made it Gluten-Free. But, yum!! Thanks for sharing! I found this recipe on FoodGawker and it is awesome!! My younger son who is a die hard Kraft Macaroni and cheese eater, absolutely loves this!! I also found this recipe on foodgawker... wow! This is absolutely amazing! My husband and picky toddler loved it, too - definitely my new go-to mac & cheese recipe! Thanks! I brought this to my aunt's for Thanksgiving and it was AMAZING. Needless to say, no leftovers. And my boyfriend's mother wants the recipe. BOOYAH! this is amazing... found this on foodgawkers soooo delish. I love this. 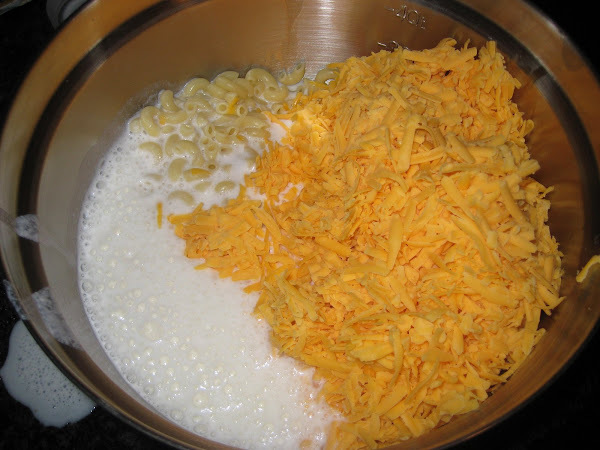 All time favourite Mac and cheese recipe. I used grainy mustard instead of powder and added some green onions and thyme. Sooo good. Thank you for posting this amazing recipe. Found this on pinterest. LOVE IT! YUM! also found this on pinterest...made it tonight and it was de-lish!! thanks!! me too via pinterest - making it tonight! looks so great!! I love Mac-n-Cheese! I'm always on the prowl for new recipes. Im making this tonight with a twist! It looks amazing! This looks absolutely yummy. KInd of ironic that there is a Jenny Craig advertisement beside this recipe. That's what I call comfort food. Yum! Looks awesome! Making me hungry so close to dinnertime! I just cooked this up, and it is absolutely delicious. I used a little less butter because I prefer it to be a little more crisp, but it is absolutely delicious! hey, this recipe was great! i didn't have enough breadcrumbs when i made it, so i topped it with french's french fried onions instead of the crumbs. came out soooo good, gonna use it with the regular green bean casserole this year. I'm definitely making this recipe for Thanksgiving this year. I've been looking for a good recipe. Thank you! This looks amazing! I'm 19 and I'm planning on contributing to Thanksgiving this year. I've been looking for a pretty easy, but delicious, recipe & I'm pretty sure this is it!! I wanted to add crumbled bacon to it, also? Hmm.... Thanks! Using this recipe for Thanksgiving!! Thank you.. it looks so good!! I will be making this for my daughter's 1st birthday. This looks delicious! We were looking for a mac n cheese recipe to make on Christmas and came upon this one. It was the best dish we had at the table, so delicious! I have made baked mac n cheese in the past but nothing came close to this one! I have tried to make mac and cheese over and over and it is never as good as my grandmother used to make. I am going to try yours. I like the milk in jar technique. So happy to have found you on pinterest. I am now your newest follower. If you have a chance check out my blog. 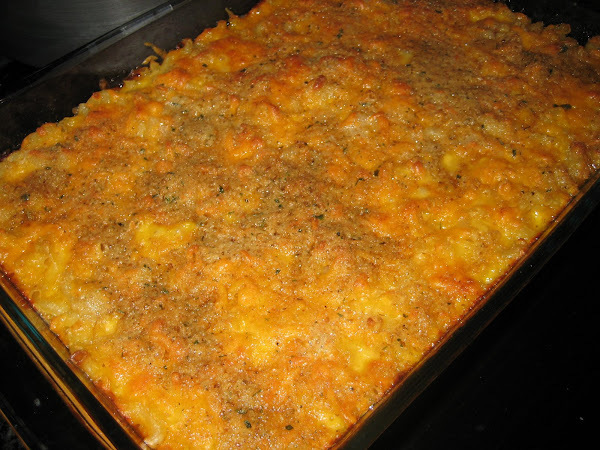 In the South, baked macaroni and cheese appears often at Christmas and Thanksgiving dinners. It's the mashed potatoes that we don't go for. Usually serve rice instead. Very well written recipe. Looks easy enough that even I could make it I think hehe! Mac N Cheese is one of my favs. I love seeing a baked version of it. Mmm! Just made this today for our 4th of July get together and it was hit with kids AND adults! I just added it to the menu for my daughter's 1st b-day party this weekend! Followed the recipe exactly. I'm curious how a blend of plain breadcrumbs and italian breadcrumbs would taste. i made this mac and cheese recipe for an oscar's party and it was so rich and delicious! i'm visiting with family and am treating them to this awesome recipe for dinner tonight! Baked macaroni has always been a staple item at my family's Thanksgivings. It's the dish I always looked most forward to. This looks DELICIOUS! We always have mac n cheese on thanksgiving...and whenever we get the urge. We loooove it! But I always end up with afrozen one :( tried to make homemade once and it was NOT good lol. This looks easy and delicious. Im trying this recipe tonight! Thanks! Very good! My husband said it tasted like his grandma's recipe! Found this recipe on pinterest this dish is as good as it looks. The bread crumbs went great with the cheeses. I can't wait till I make it again. Great dish !!!! Made this last night it was so delicious! I used rice crispy treats instead of bread crumbs quite frankly because i forgot them at the store.... and its a 30 min drive. HA twas so yum! I love the simplicity of the recipe, yet the flavour is so rich and creamy. I like onion with my cheese, so I make my flour mix in the blender adding roughed chopped onion, tbsp mustard, ketchup, bajan pepper sauce. This is now my go to recipe when ever I'm making Mac and Cheese. Im making it for a smaller group. Can i cut all the ingredients in half? I made this today with my leftover cheeses, swiss, monterrey jack, and mozzarella, and used garlic salt and italian bread crumbs since that's what I had. 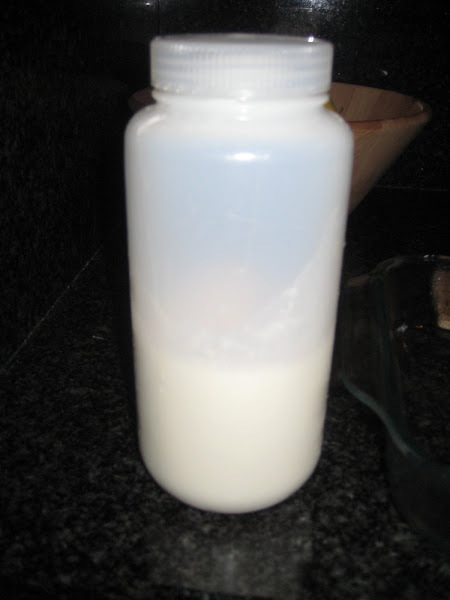 I also used 1 C evap milk and 1 C water since I didn't have milk. We had nothing in our kitchen but this stuff and it came out awesome!! I used two loaf pans instead of the other sizes. You can definitely cut the ingredients in half. But there isn't a need to, I promise this dish will go fast! You can surely make this the night before and then just bake it the day you plan to serve it, I do that ALL the time! Sorry to hear that you didn't enjoy it. The flavor is really one of just cheese, lots and lots of cheese. I find it very important to use one block of Sharp Cheddar and another Block of Extra Sharp Cheddar and to shred the cheese yourself, the preshredded stuff just doesn't produce the same results. The green flecks in mine are from Italian Breadcrumbs that I used to dust the top of the dish. My recipe says to use plain, because I always use plain, but if I recall correctly I think I was out the day I made this version that I photographed and had to use Italian. Either works, but I prefer plain. The other flavor element is onion salt, but once again cheese flavor is really the huge take away here - nothing more fancy than that. This looks fabulous but I wanted to know if you tried playing around with the cheeses. Do you only use cheddar? Have a tried a mont-jack or muenster? Also, have you tried adding mustard to the mix? I have made baked mac and cheese before, but it tends to be dry. I like the way yours looks creamy, but I wanted to ask if you have tried playing with the flavor profile before I tried adjusting the recipe. I have never made any substitutions to this recipe. As I mentioned it is one of my staples and so widely loved that I have never had the desire to change a thing! But do let me know if you try it out with different cheeses, I would be interested to hear about the results. This looks easy and delicious so, that's why I'm making it for dinner tonight. How many servings does this make? I just boiled 8 ounces of noodles and it doesn't look like very much. I'm also planning on making this for Thanksgiving and need to feed a lot of people. Great blog! I know 8oz of pasta doesn't seem like a lot, but this recipe probably feeds 6-8 people. I make it every Thanksgiving and have never doubled it and we always have enough - no leftovers, but enough. hi- this looks so good, i want to make it for thanksgiving this thursday. i was wondering if you have ever prepared the dish, and left the baking for the next day? im wondering if this would effect the thickness of the sauce. thank you!! Made this for thanksgiving and everyone absolutely loved it! The only thing I did different was add a can of stewed tomatos. Hands down best mac n cheese I've tasted!! It's going to be a regular at my house. Just curious this uses 8 oz of macaroni and not a 16 oz box??? Correct, just 8 ozs of pasta. I normally do a heavy pour, but never use the whole bag. Just a little more than half. Found this on pinterest a couple months ago and have made it several times. It is by far the best mac and cheese recipe on there. I'm bringing it today to a family Christmas party. I found this recipe more than two years ago on FoodGawker and I have to say I absolutely love it! The younger kids don't like the breadcrumbs so I only put them on half and it's still a great dish. I will say, it makes a huge difference if you do not grate the cheese yourself. It's time consuming but SO WORTH IT. And definitely use that extra sharp cheddar. Fantastic recipe. Quick question: How many servings does this make? This recipe serves 6-8 people comfortably and if you serve it with additional sides you could probably stretch it to 10-12 people. This was great! Thank you so much for sharing this delicious recipe. Since it's just my husband and I, we had about half left over. I froze it... but now we want to eat the rest! How should I go about re-heating it? The Mac-n-cheese is in the glassware that I cooked it in. So glad you enjoyed the recipe! I always just reheat the mac and cheese in the microwave. About 45 seconds a serving will get you a nice, hot, bubbly bowl! if i want to double the macaroni do i double the whole recipe ? You could add twice as much macaroni without doubling the cheese and sauce, but it wouldn't yeild the same rich results. If you want to make twice as much, I would double the entire recipe. When you are putting the extra cheese on top, do you put it on top of or under the bread crumbs? 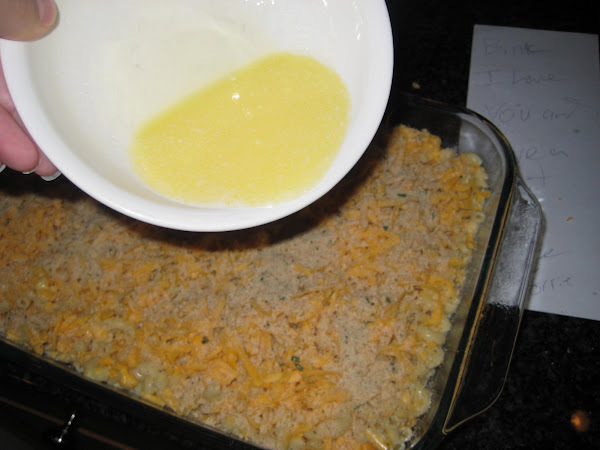 I sprinkle the last layer of cheese and then I add the breadcrumbs on top of that cheese, then i pour the melted butter. I made this last night, and it was a HUGE hit! It was the first meal that I've ever made on my own! 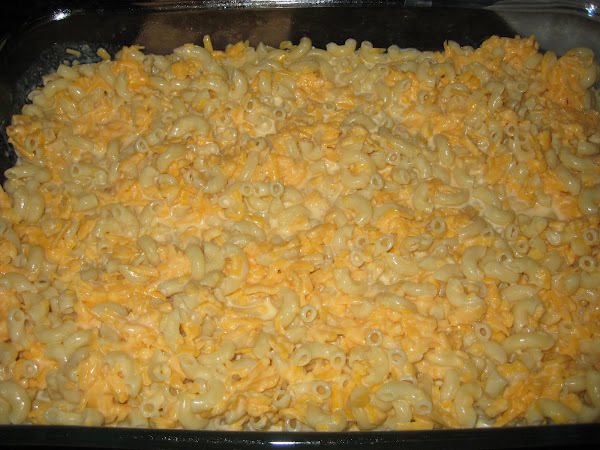 I am looking for a baked mac and cheese for a family get together in a cabin this weekend, this is it!!! Thanks! I've read all comments and cannot locate whether or not to boil the macaroni first? COOK macaroni according to package directions; drain well. Set aside. - under ingredients. Greetings from Indonesia! I made this and my friends really love it! So, can I add bacon or some kind of meat to this recipe? This was my first time making macaroni & cheese and it was amazing. Looking forward to leftovers tonight. I wouldn't make it very often, but this recipe is a keeper for sure! Has anyone tried this recipe with 2% milk and if so did you still have good results? This was an amazing recipie! I followed the directions except I mixed in homemade bacon bits. Highly recommended! It is going to be my go to mac and cheese from now on!my family loved, loved, loved it! A-mazing! I've tried plenty of mac n cheez recipes,but this is the best one by far! The only thing I did different was use pepper jack & Colby jack cheese..ok, n a lil black pepper n ground mustard. I was a little skeptical of the look of it when i poured it in the baking pan, but im glad i didnt let that stop me. Absolutey delicious! This will be my go to mac n cheese from now on! Thx for sharing! I've made this many of times and love it. So does my husband and our families. I was wondering can you male it without the breadcrumbs? This has been my go to for the past 2 years. It's been a bit every year! Got to make it this week for thanksgiving! Mushrooms, Marsala, Mozzarella - Oh My!